Of course they're not calling it that but I think doing so illustrates just how cheap food has become. 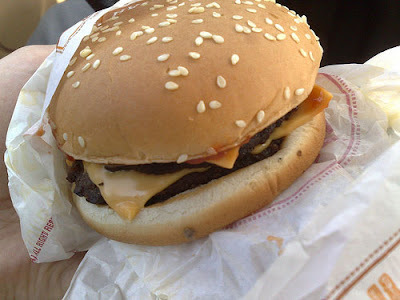 That $0.0019 per calorie applies to Burger King's new $1.00 Double Cheeseburger campaign. Burger King's Double Cheeseburger has 520 calories and with a cost of a dollar that'd be $0.0019 for each and every calorie. Per calorie that's exactly 10 times cheaper than their $3.99 Garden Salad with Tendergrill Chicken without croutons or dressing which clocks in at $0.019 per calorie and 13 times cheaper than the $1, 40 calorie side salad ($0.025 per calorie). Add in the dressing and croutons and it's still 4-5x cheaper per calorie to hit the burger. So let me ask you - if you didn't have much money, were hungry, and you walked into a Burger King what would you buy? I know where I'd spend my money. And people claim weight's only about willpower. "Calories load the gun, the environment pull the trigger"
And boy did Burger King squeeze it hard.